The 2011 Ford Mustang Shelby GT500: Who Let The Snakes Out? Poll: What’s the Best Modern Muscle Car? Muscle cars. Just hearing those two words is enough to send your testosterone production into overtime. But there’s one question that has remained unanswered since the ‘70s: which muscle car reigns supreme on the streets. AutoWeek has gotten the inside line on the new 5.0-liter that Ford plans to ship in the 2011 Mustang. Brace yourself, as it sounds like Ford has made plans take hold of the reins in the American muscle ring. 412 ponies will be driven by 390 ft-lbs of torque…from a 5.0 V8… with a redline of at least 6,500 RPM. That’s 83 horsepower per liter. The all new aluminum block and cylinders have been designed to let the engine breathe like an Olympian running the 100-meter dash. Cast iron sleeves help protect the light-weight block while distributing large amounts of heat away from the cylinders. Now compare this to is American breathren. The Camaro SS outputs 422HP from it’s 6.2-liter V8, and the Challenger puts out a healthy 425 HP from its 6.1-liter SRT8 hemi. Both vehicles should weigh considerably more than the 2011 Mustang, which should give the Blue Oval a significant advantage. So, which would you take down to the strip? 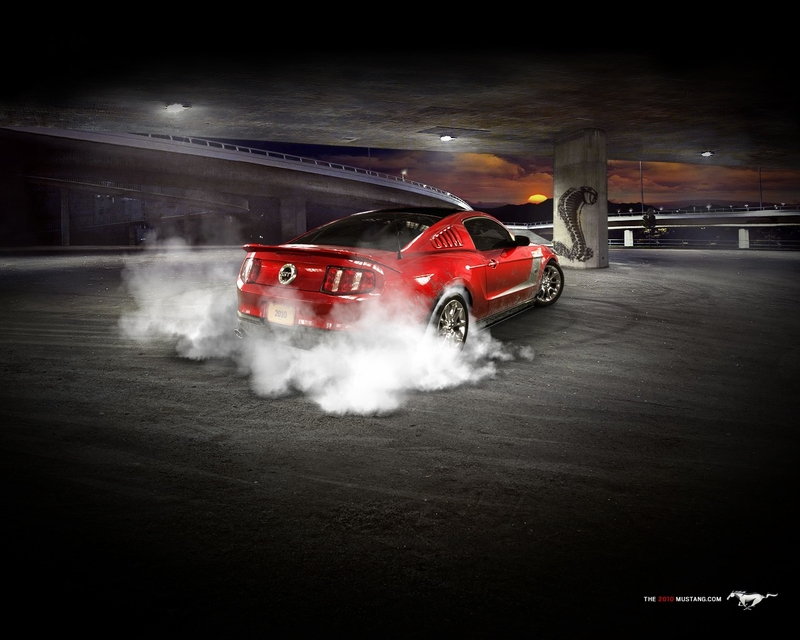 Design Your Own 2010 Ford Mustang… with Burnouts! Ford has released a fancy, schmancy new website that lets you build up a new 2010 Mustang with all the trimmings; custom paint jobs, rims, body kit’s and a custom level of smoke coming from the rear tires. My guess is that this is to help boost sales and beat out the Camaro, but Ford has done a great job here and although it takes forever to load, it’s a fun website to around with. We’ve seen some incredible machines as of late; a twin turbo M5 M3, an LS9-powered Camaro, even a 2700 horsepower F150! But this one probably takes the cake as the meanest, fastest street machine around; its a 94 Mustang Cobra powered by a Viper’s 8-liter V10, which is force fed by a couple of T-76 turbos. Some modification was needed to make everything fit, including moving the firewall back 10 inches and custom fabricating engine mounts and suspension linkages. This has all taken months of work, but the day has finally come to turn the key. Listen and enjoy this deep hiss of this Cobra. This is a big day for Ford as an automotive icon of their design turns 45 years old. The Mustang has had many competitors over the years as the muscle cars war raged on. To this day, many try to live up to the Mustang’s prowess; some do, but many don’t. Check out this time line to see how the mustang has evolved over the years. Happy Birthday to all the Stang’s out there. Believe it or not, Hyundai considers their Genesis Coupe to be a main competitor with the Mustang, Camaro and Charger, so they also wanted to say Happy Birthday in their own special way. Check it. You can also leave a comment about us on our AutoAnything Google+ Local Page. If you like the articles we are writing and would like to learn more about what auto parts do and how they work, then try subscribing to the official AutoAnything Article Feed. If you want to stay up to date on the happenings at the AutoAnything blog, you can subscribe to the AutoAnything Blog RSS Feed. It updates in real time and is a great way for you to keep track of what's happening in the automotive world.